2nd Annual Halloween Challenge Results! Welcome to our Blog Hop A Miniature Blog Hop! As the holiday season approaches, consider taking on a mini project to add to the enchantment of the season using one of two Elf Door Kits – the Fairytale Elf Door Vignette Kit and the Enchanted Elf Door Vignette Kit. These tiny doors make your home more festive during any season, including the holidays, and can be enjoyed by everyone in your home, being mindful to keep out of reach of any tiny hands and paws. To join in on the holiday merriment, we’ve partnered with some great craft bloggers to bring you ideas on how you can finish our Elf Door kits! Let’s meet our hosts: Sword Fights and Starry Nights, Ritzy Parties, Craft Shack Chronicles, Laura’s Crafty Life, Make Life Lovely, and Made by a Princess Parties. Before we get started, we decided to partake in the fun and finish our own Elf Door kits! 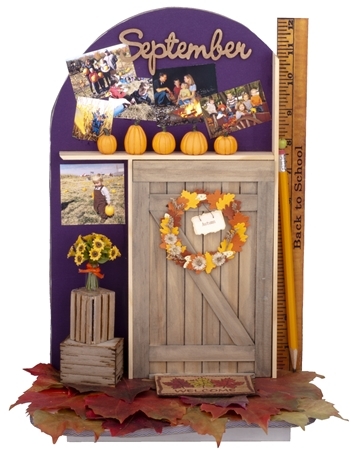 The Enchanted Elf Door Vignette Kit is a rustic, barn-door style and has been decorated with a fall theme using other miniature items like mini pumpkins, a fall leaf wreath, a sunflower-filled flower pot on top of wooden crates, a ruler, and leaves. However, the kit could really be used to highlight any month or event such as birthdays or Tooth Fairy “visits”. Add a few pictures to highlight special memories from the highlighted month or season. For project instructions to recreate this scene, click here. 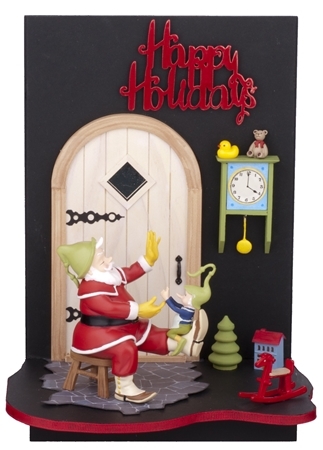 Next up, Santa’s workshop was created using the Fairytale Elf Door Vignette Kit and highlights a miniature Santa, his helper elf, a clock so they know when to finish their toys, an assortment of toys, and a holiday message. This cottage-style door kit could just as easily be decorated for a shelf-sitting elf to use as he travels back and forth from the North Pole leading up to Christmas. For project instructions to recreate this scene, click here. Are you feeling inspired now? You ain't seen nothing yet. 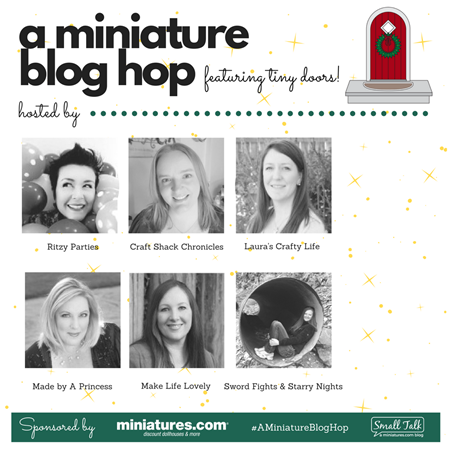 Check out our official A Miniature Blog Hop hosts’ magical little doors below. Plus, don’t miss their exclusive miniature giveaway AND coupon code!